As you near the fort, you can hear the commander feverously barking orders to his gun crew. The air suddenly cracks with the sound of cannons firing. Overhead, fire and smoke blast from the cannon muzzles jutting out of the embrasures on the bastion. The echo of cannon and the smell of black powder drift on the air and waft down the glacis, the grassy slope beyond the walls, toward you. It's a reenactment day at Fort Stanwix National Monument! Think you can only be a spectator? No! 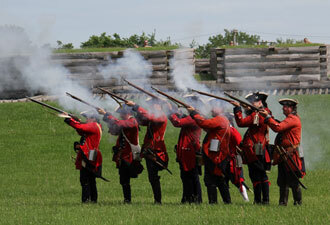 Come don a regimental, grab your wooden musket, and snap to attention! Your sergeant will teach you the steps to firing a musket and set you to marching as a Continental soldier. Jump to the call of the gun commander and learn the complexities of the cannon, the most powerful and fearsome weapon of the 18th century. You'll come to understand the feat that this small fort accomplished as it stood steadfast for 21 days in the face of a British bombardment. 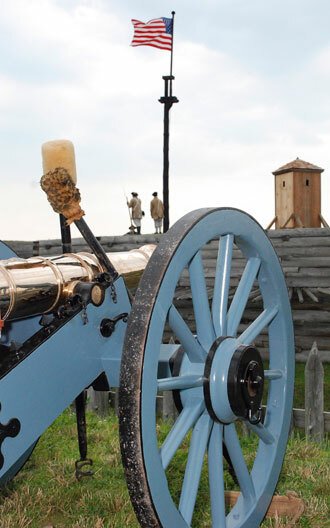 Immerse yourself in this 1777 victory at Fort Stanwix which, coupled with the British surrender at Saratoga, became the turning point of the American Revolution. Can't find your children? Check over in the Gregg Barracks. They're probably in the children's corner playing with colonial toys and trying on military coats and fashionable 18th century ladies' attire—made for just their size. 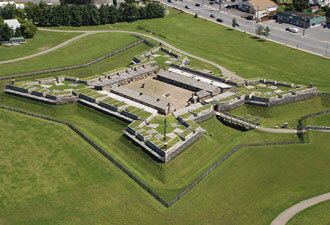 From the Gregg Barracks, head out to explore the rest of the fort. Don't worry about not having any Continental scrip. Your early American currency won't help you much as you enter the Sutler's. He much prefers beaver pelts in trade for his store's goods. Have a seat by the fireplace—this is the place to hear all the most recent news on the state of the war. Go ahead, dare to walk down the darkened tunnel that you've spotted. It will take a moment for your eyes to adjust to the dark. The air will cool and feel damp on your skin the further down you go. The tunnel finally opens to reveal the bombproof, a small room which doubled as a military hospital for sick and wounded soldiers. For those who prefer a little less noise and a climate-controlled atmosphere, the park offers an extensive exhibit area in the Marinus Willett Center. Here one can explore centuries of history through the many interpretive exhibits and cases of artifacts unearthed on site. Special guided tours of the park's collections offer you a behind-the-scenes look at some of the more than 500,000 artifacts that the park cares for. Special events, encampments, and children's programs highlight the warmer seasons. The Honor America Day concert, performed by a local symphony orchestra, takes place every July, complete with the fort's cannon sounding during the 1812 Overture. The park also manages both the Oriskany Battlefield and Steuben Memorial state historic sites, all three locations inexorably connected from the time of the American Revolution. Fort Stanwix National Monument, open 362 days a year from 9 am to 5 pm, is located just north of Interstate 90 and 35 miles from the Adirondack Mountains. We'll have the soldier on guard duty up on the parapet stand watch for you!